When people join us for dinner, they are always pleasantly surprised how smooth the evening went and think my children are angels! I love that I tricked all my friends into believing that falsehood, when the truth is, there's a formula I use to make sure things go as smooth as possible when I head out to dinner with the children. 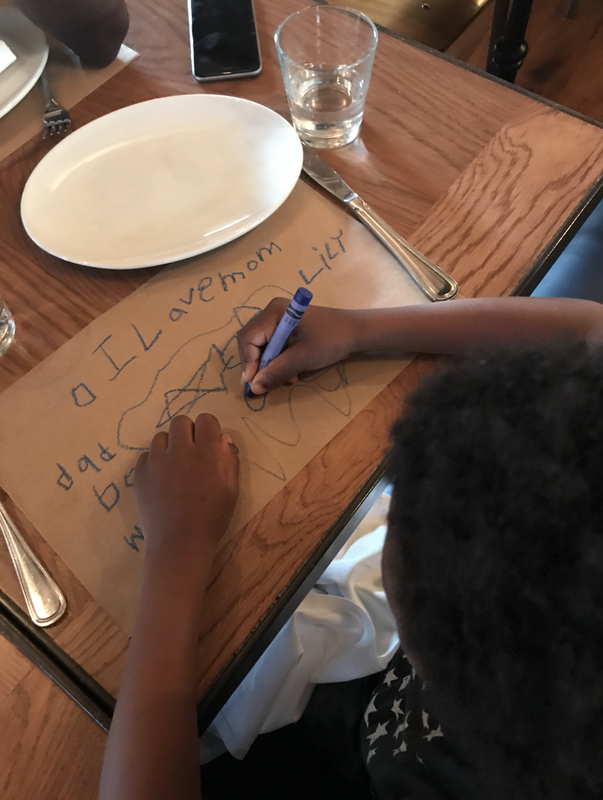 Here’s a list of tips and tricks I’ve learned over the years to ensure the best dining experience for me and the family (...and my friends when they tag along)! Some are on a mission to create the trendiest spot in town, while others are focused on creating a thoughtful experience for a range of people to enjoy. Do your research and make sure you choose wisely when you have the little ones with you. Keep an eye out for places you see other families frequent and look online for lists of family friendly restaurants in your city. Make sure the menu have food options your kids will enjoy. If you are in a new city and need to choose a restaurant quickly, choose a restaurant housed inside a hotel. Hotels are typically great at accommodating families. Once you find a few great spots, become a regular at these places so they already know how to accommodate you when you walk in with your crew. Make sure the location is spacious and can accommodate your stroller or carseat. If the restaurant is on the smaller side, plan to leave the stroller at home or plan to fold it up and leave it at the door. Find out when the restaurant opens and go early! My sweet spot is a 6:15 PM reservation. The earlier you go, the more attention you’ll get from the staff. Management and servers are more likely to be accommodating when they are not that busy. Go online and glance at the menu in advance, so you have an idea of what you will order when you arrive. Kids dishes usually take less time to prepare. Make sure to ask your server to bring out the children's dishes as they are ready, so you can assist them with eating if needed. Let your little enjoy some bread while waiting for their meal. Bread keeps their hands busy! But not too much, they need to save room for food! A silicone bib that catches the mess and is easy to clean. Always pack a swaddle. It’s great for so many things. Use it to cover your sleeping baby, to lay on the banquette as a sheet if they need to sleep, as a breast feeding cover, the list goes on. Disposable changing pads are great to place on top of the changing table to create a clean surface to change your child. Snack cup with filled with goodies for when the wait gets too long. Wear a breastfeeding friendly top for easy access. There's a few seats in the house that I consider to be family gold! Kids love a window seat! 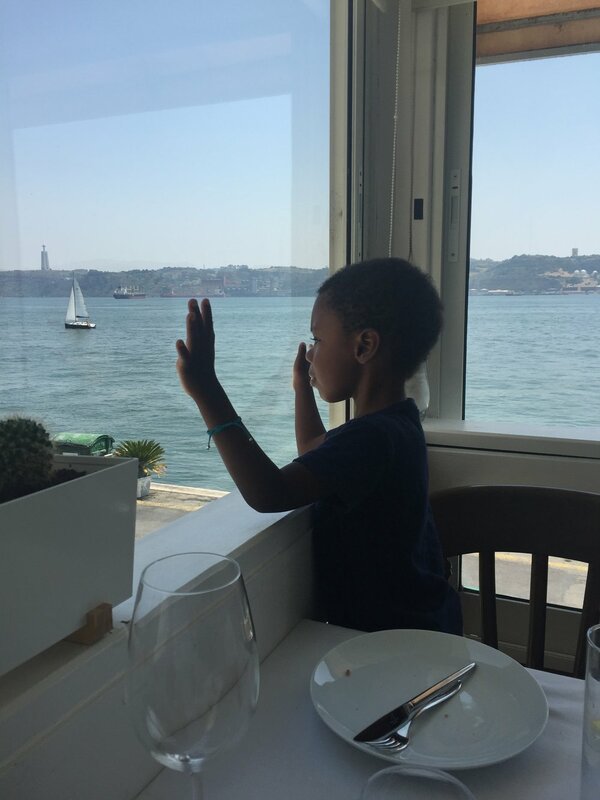 My son Lukas loves to gaze out and look at the passers by. If the weather is nice, outdoor seating a great choice since it usually comes with a more relaxed vibe than the main dining room, which can be perfect for children. Go for the booth! Space is key and if they fall asleep, your little one will have a cozy space to lay down. If you pay close attention to your little one, after a while you’ll start to notice their habits that lead to major disasters and the things that trigger their meltdowns. For instance, Lukas use to get a thrill out of ripping the sugar packages in half and making it rain sugar all over the table and Lily likes to splash and spill water all over the place. So now when when we dine out, as soon as we are seated, I hand over the sugar to the host and make sure there is no water bottles or glasses near Lily. That’s 2 potential disasters diverted that could have ruined a lovely evening. Dining out is an important social skill to teach your children. I think its important for children to learn how to engage in conversation and display good table manners. In the age of distracted everything, I try my hardest to make dinner time a moment to actively engage with each other and connect. This means no tablets or phones at the table for watching TV or playing games. At dinner we like to recap the day, then move on to coming up with silly things to say "cheers" too. It always ends up being super goofy, but we love it and all end up laughing! Come up with your own rituals to make dining fun with the little ones. I keep a few items in the bag to keep the kids entertained if needed. A coloring/activity book, crayons, favorite books , a small stuffed animal, mini cars and action figures. I only break out with the tablet if I'm having an extra long brunch/dinner that is adult focused and I have exhausted all of the other non-electric activities. Create an idea of how you would like your future toddler to act in your head while they are still a baby and constantly instill those habits in them from the start. If you let them watch your phone at the table as a tiny toddler, a few months later, they will think they own your phone as soon as they walk into a restaurant and throw a tantrum if they don't get it. If you are consistent, after a while it sticks. Teamwork makes the dream work! Take turns giving your fussy toddler a walk around the restaurant or a quick pop outside to calm them down quickly. They don't have a changing table? Don't fret! Just pack a disposable changing pad to change your kid on the counter near the sink. If there's no counter space, a desperate mommy trick to changing a diaper without a flat surface is to sit on the toilet with the lid down, place the changing pad onto your lap, lay your child down (with their head near your knees) and change them right there on your lap. If you child becomes super fussy and can not be calmed down, kindly ask for your food to be boxed up, pay and leave. It's hard not to feel embarrassed when your kid has a meltdown in a restaurant, but meltdowns happen, the key is how well you handle them. Remember that family time is supposed to be fun! Make sure to set the tone with great vibes, bright conversations and fun rituals! These things keep the kids engaged and looking forward to dinner time out with the family. Cheers to many successful outings in your near future and if you have any other tips, tricks or advice, you would like to share, please feel free to leave them in the comments below!